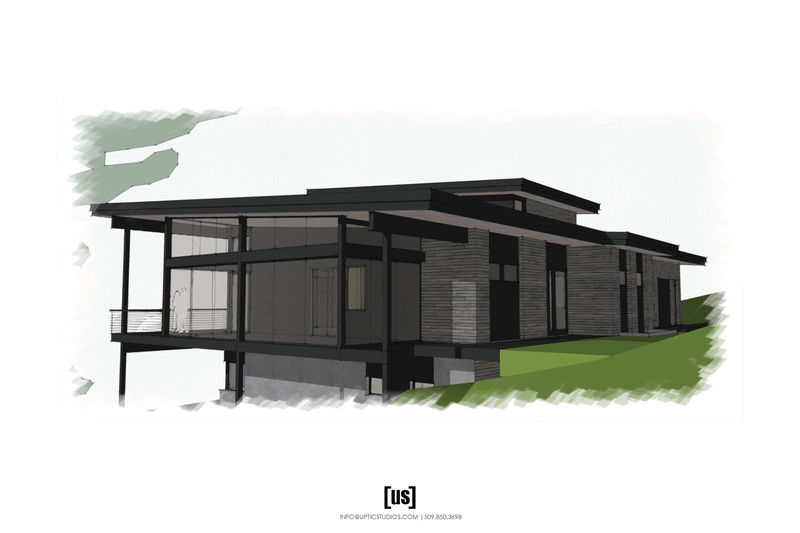 This 3,700sf modern home was custom-designed for the homeowners by Uptic Studios. In the hills south of Spokane, Washington, the setting of the house provides a beautiful west-facing view of the western valley and the sky which are taken advantage of with abundant windows and a wrap-around deck. 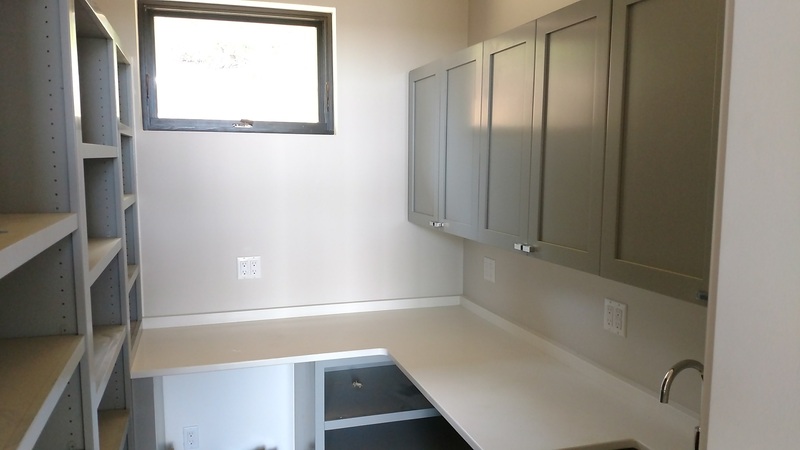 The walk-out basement provides easy access to the surrounding open space for the homeowners and their four-legged companions. Exterior photos coming in Summer 2018. 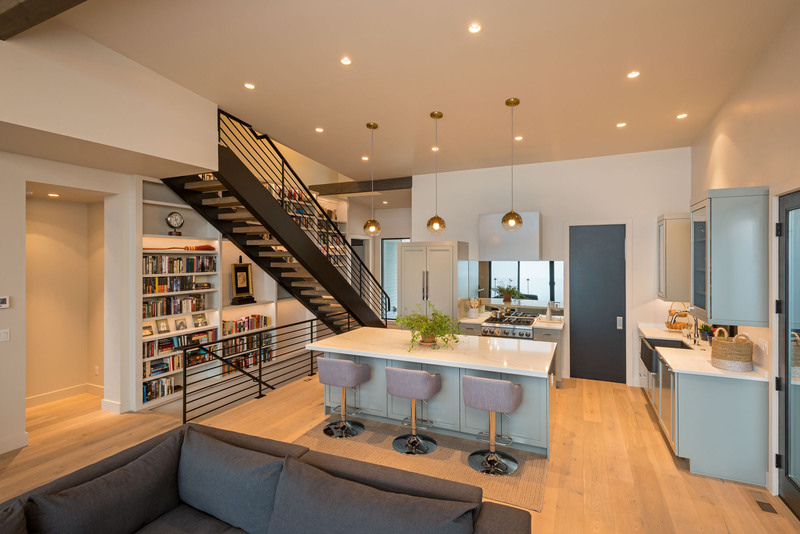 The floating black metal staircase with wood treads and built-in bookshelves holding favorites and memorabilia, bring warmth to the clean lines and open space of this modern home. The paneled appliances in this clean, modern kitchen blend seamlessly into the cabinetry. 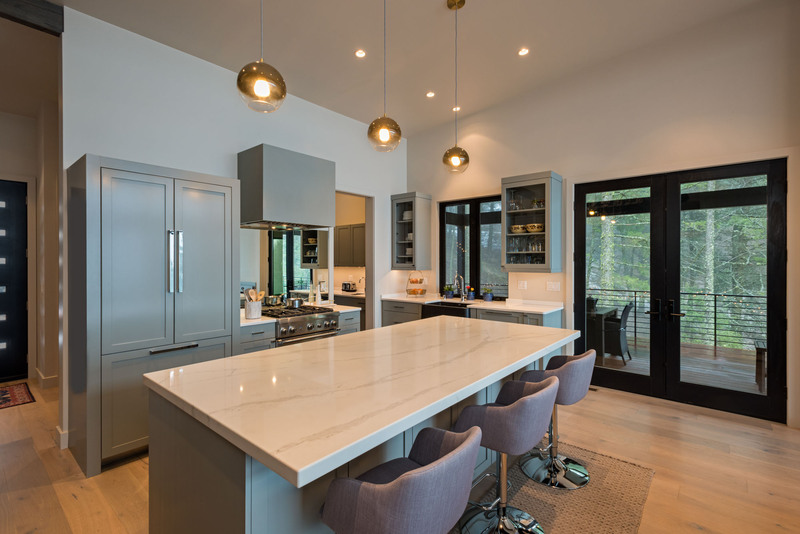 The expansive quartz island offers plentiful room for food prep as well as friends while the walk-in pantry hides the kitchen clutter. The free-standing stairs and built-in bookshelves are a central design element for the great room. 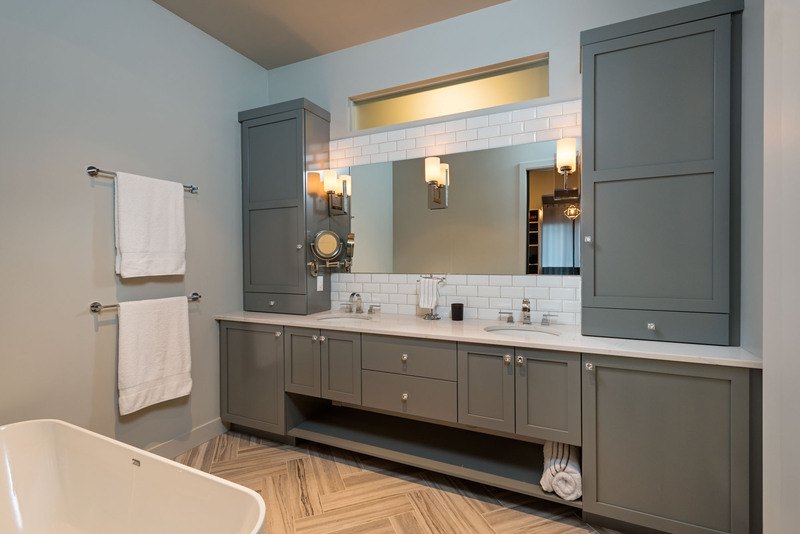 The master bath includes a free-standing tub, heated floors under the herringbone tile and plenty of cabinet space leaving a clean and clutter-free space. The full-size walk-out basement houses three bedrooms, a full bath and this entertainment room. 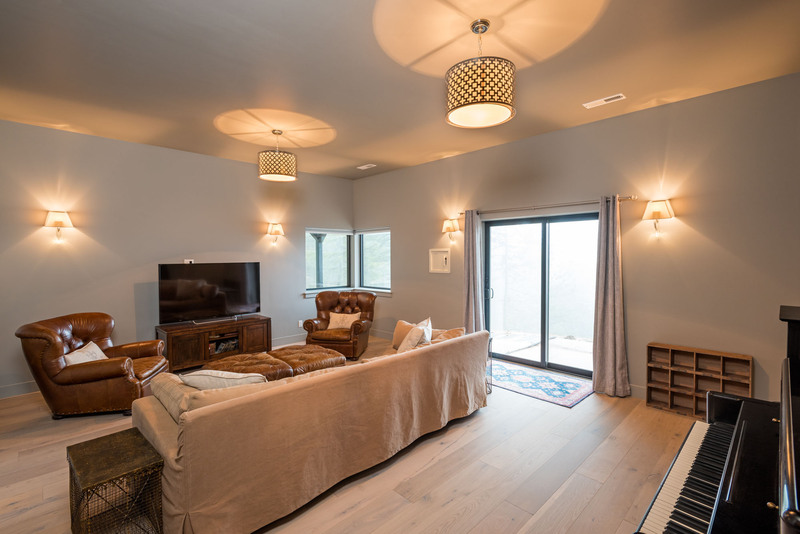 The homeowner chose some beautiful and unique light fixtures throughout the home. She says light fixtures were her favorite accessory to pick out. High on the hills, the winter clouds commonly surround this home in foggy mornings. The double-sided fireplace fights the chill in the living room and outdoors on the porch while the wall of windows and glass railing on the deck offer beautiful views of the evening sunset. 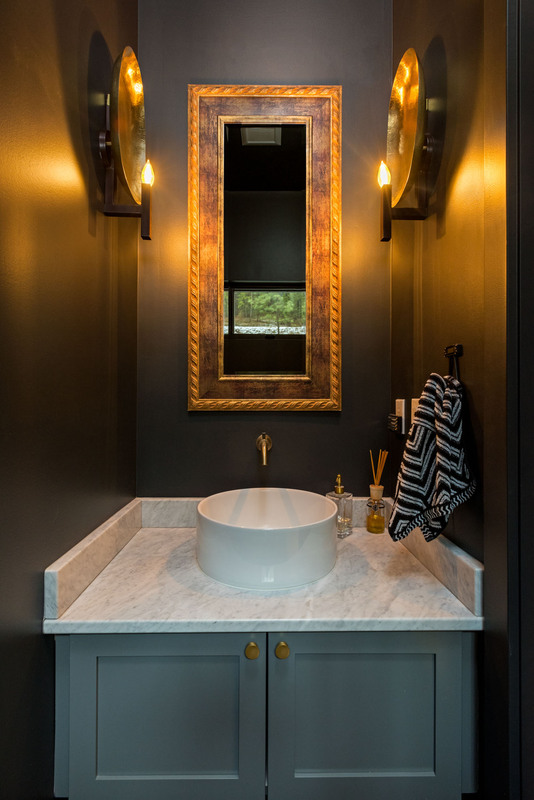 The dark walls and gold tones of the mirror and lights bring warmth to this beautiful powder room. 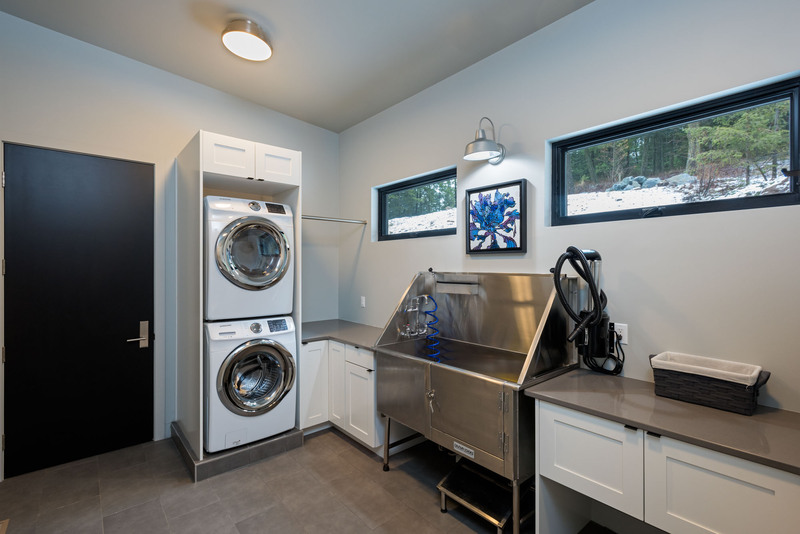 The large laundry room includes a professional dog wash and dryer with plenty of cabinet space for cleaning supplies. Exterior Photos coming summer 2018. 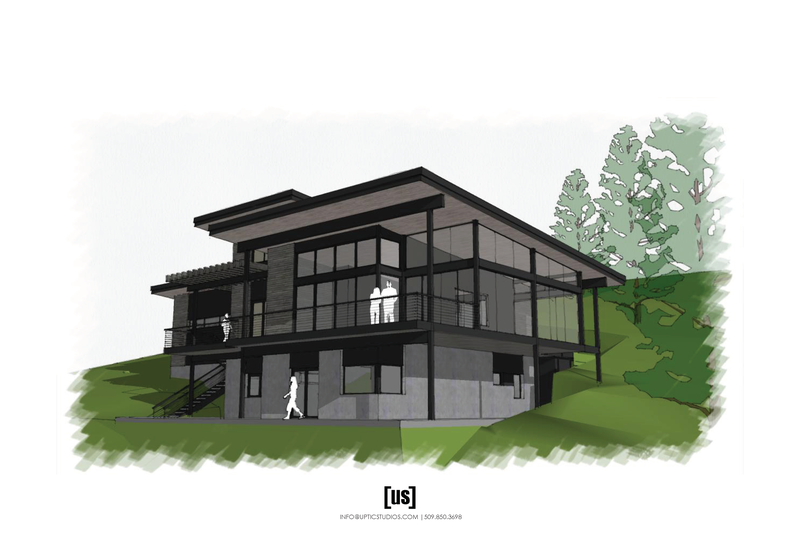 This west-facing elevation, designed and produced by Uptic Studios of Spokane, highlights this modern home’s clean lines and soaring design. 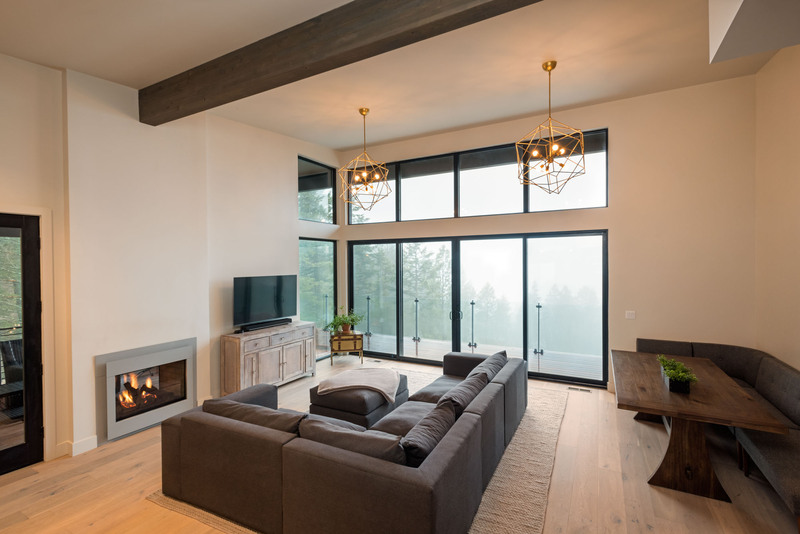 The entryway of this modern home belies the expansive, open view that the sloped roof and walls of windows provide upon entrance into the home. 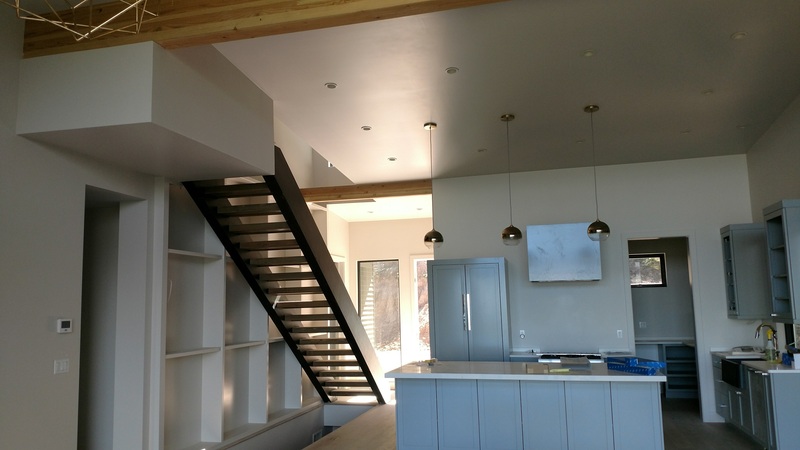 In the final stages of construction, the entryway with floating stairs and kitchen make up half of the great room with a walk-in pantry off the kitchen. The pantry with a butler’s sink provides extra work and storage space without cluttering the clean lines of the kitchen. 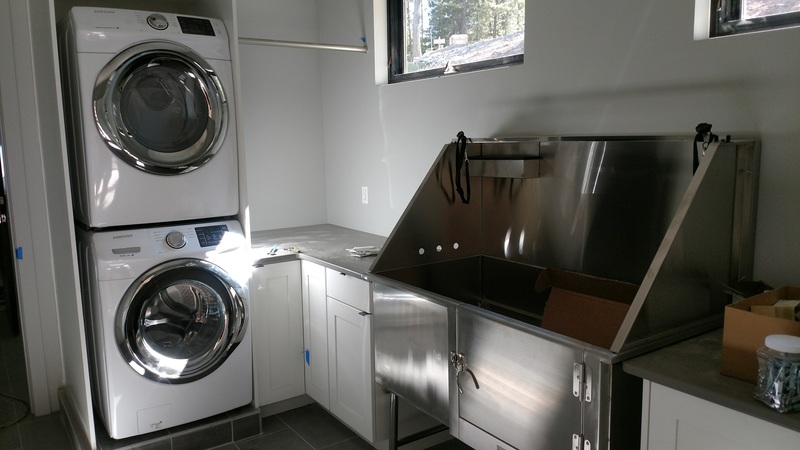 The stackable washer and dryer make room for any dog-owner’s dream of a dog wash! No more aching back over the bathtub. 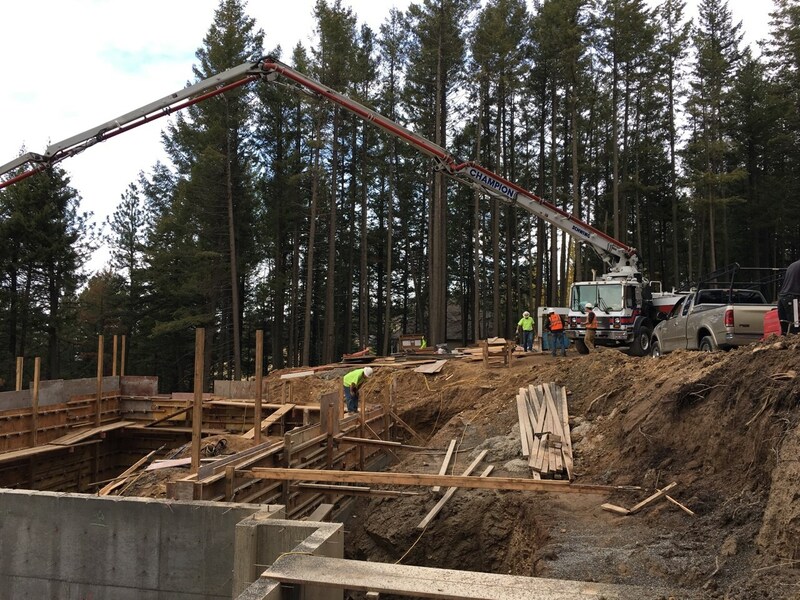 Basement plumbing is in and the forest surrounding this walk-out basement is ready for exploring! 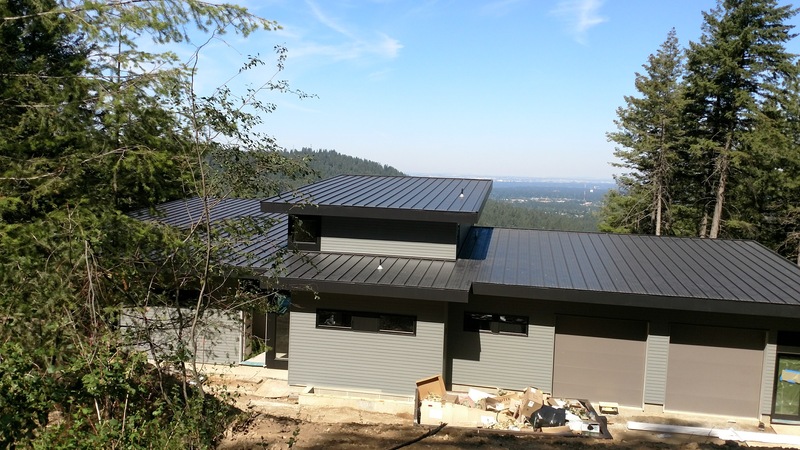 Along with the location atop the hills surrounding the city, the gradient slope of the this modern home’s roof opens the living area of the home up to spectacular views of Spokane. The angle of the soaring black roof lines makes it look as if this home is ready to take flight. 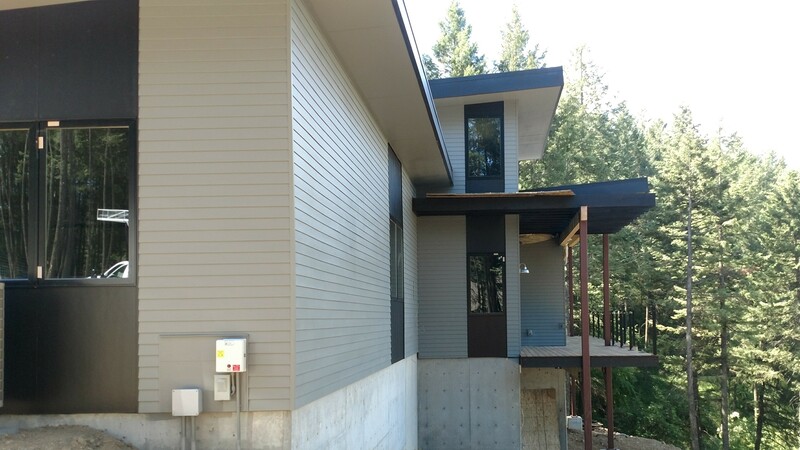 Add the black window accents against the sleek gray siding and this modern home leans toward the industrial end of the spectrum. 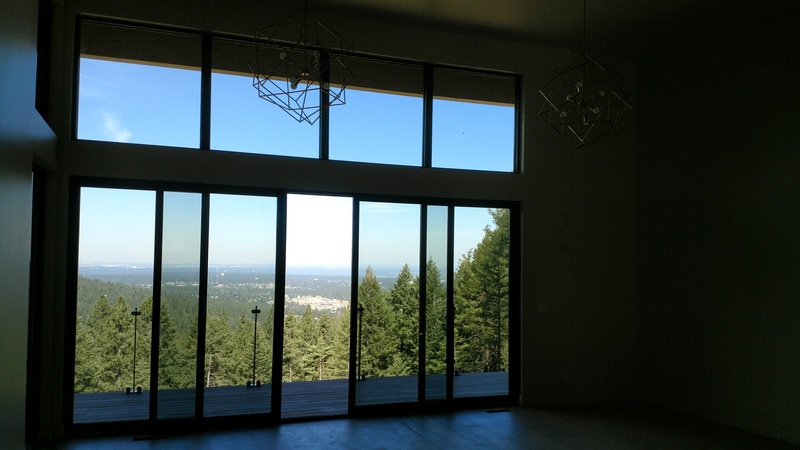 A wall of windows off the great room provide a beautiful west-facing view of Spokane, Washington. 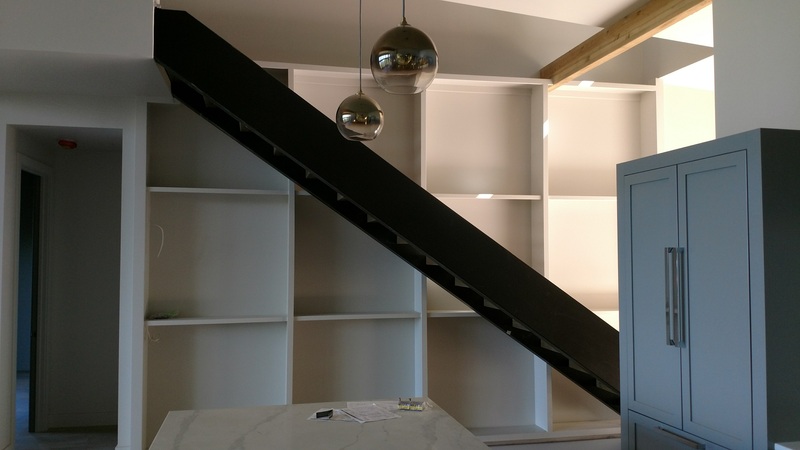 This floating staircase, still under construction, is flanked by a wall of built-in bookshelves and mirrors the stairs to the walk-out basement. 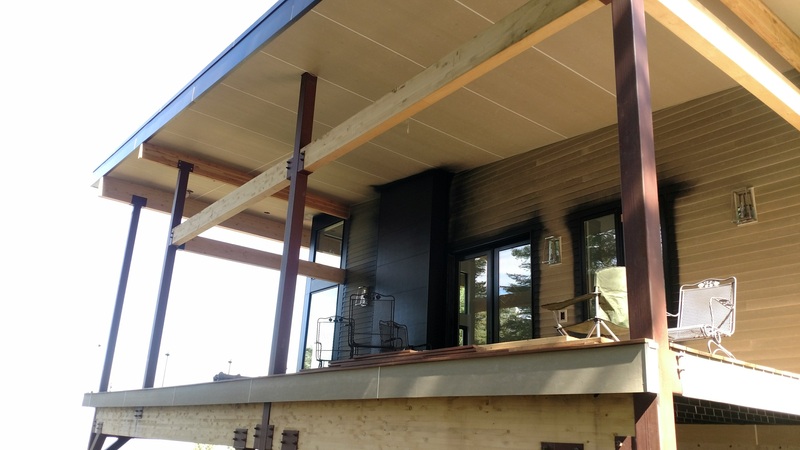 The dual-sided fireplace off the living and kitchen area will offer warmth and coziness to this side deck. This section of the wrap-around deck will also be screened-off to offer safety to the homeowners’ fur babies while allowing them to be outside. 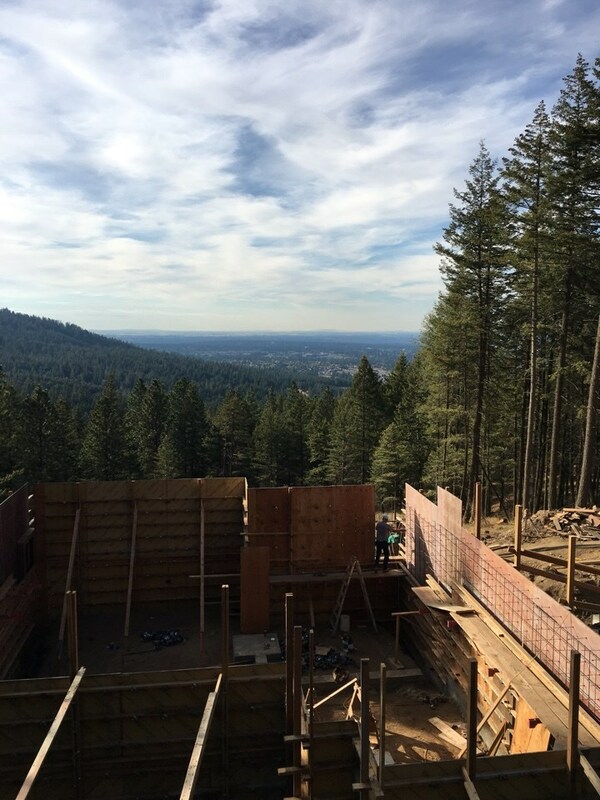 The view this home will have of valley and sky are evident in this picture as the forms are built in October 2016. 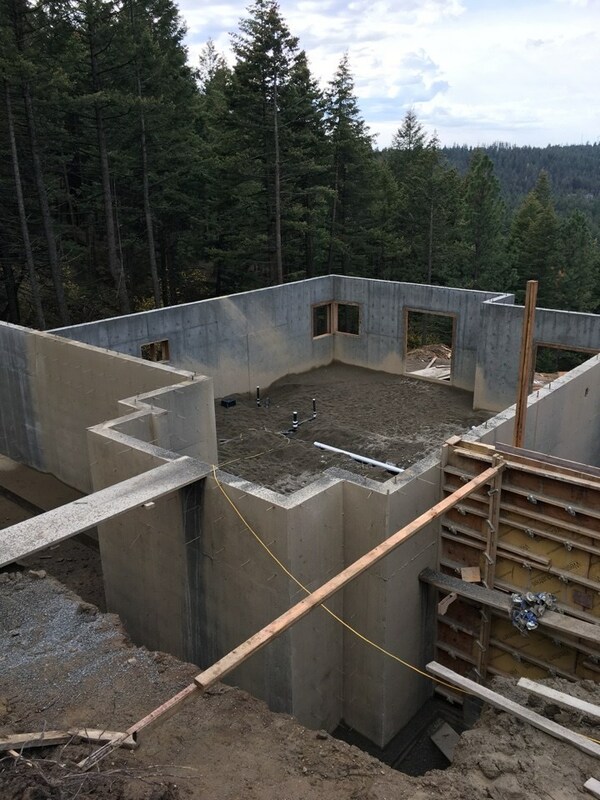 Building on a fairly steep slope presents its own challenges. Fortunately, we get plenty of practice in the Coeur d’Alene and Spokane hillsides.